LG Electronics launched the LG V30 smartphone last month and I must say that this time they got it right. The LG V30 is their best attempt ever at creating a flagship device. In February of this year, LG had launched their then flagship that is the G6 with a bezel-less display design and a huge step forward from last year’s flagship, the G5. Speaking of G5, just after its launch itself, it was already not considered worthy of a flagship status due to numerous design and build quality issues. However, building upon the success of this year’s flagship, the G6, LG launched the V30 with an even more improved and refined design, and build quality. All in all, I must say that the V30 seems to be one solid device and a huge success for LG. 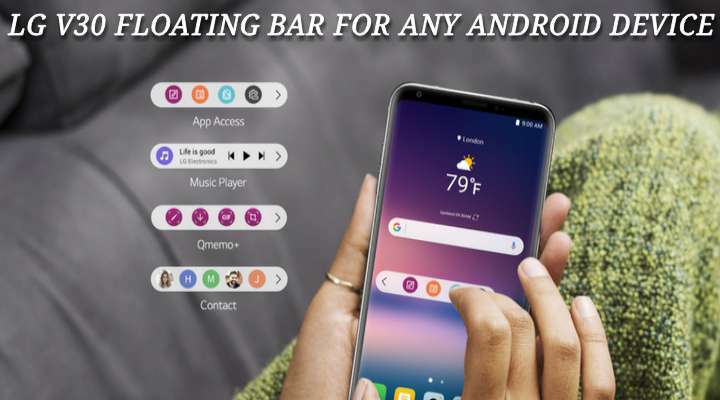 Enough said, let’s get to the point here, today I would like to review an app called Floating Bar LG V30 that allows you to get the Floating Bar feature found in the V30. Floating Bar features a floating button located at the edge of your screen indicated by an arrow. 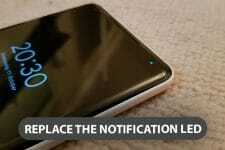 Moreover, tapping the floating button brings up a small bar with up to five shortcuts of your favorite apps. Other than apps, you can also assign shortcuts to tools, contacts, and website links (Paid features). 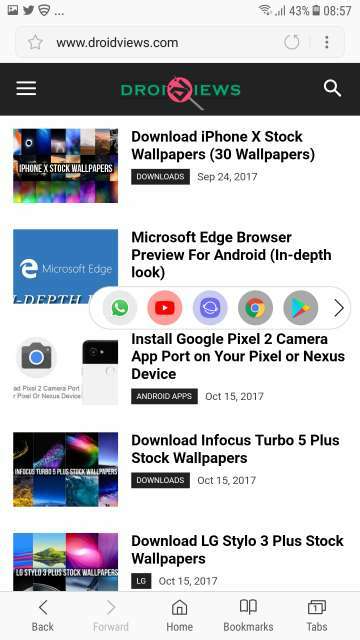 All said, let’s take an in-depth look at Floating Bar LG V30 app as depicted by the screenshots below. Add apps. 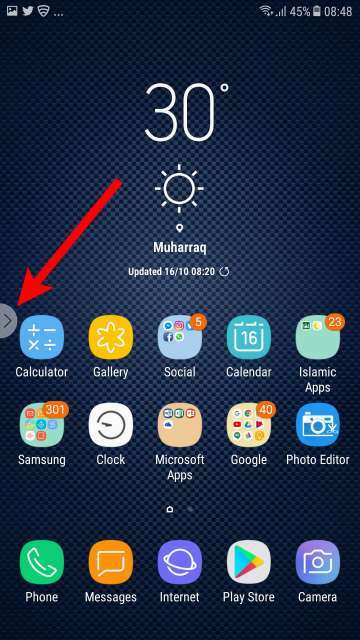 Tap the + icon to add an app shortcut to the floating bar. 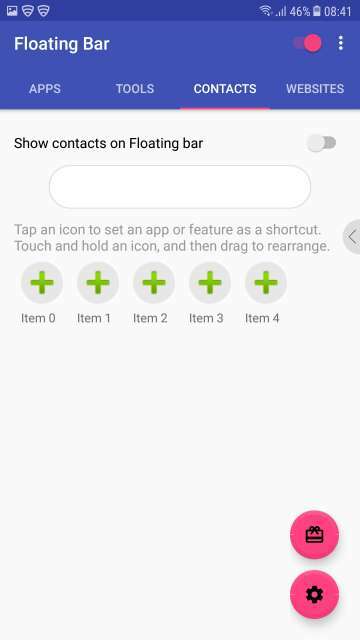 Tap and hold and drag to rearrange after adding all five of tour favorite apps. Add tools. 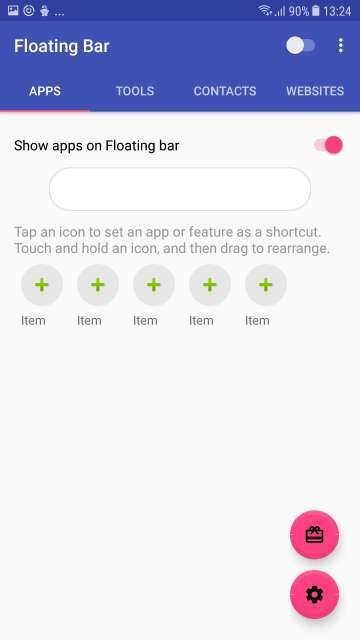 Tap the + button to add tools to the floating bar. 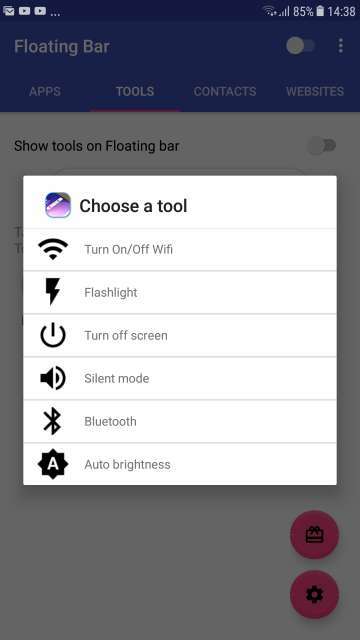 Tools available are WiFi, flashlight, turn off screen, silent mode, Bluetooth, and auto brightness. This feature is paid. Add contacts. Tap the + button to add a shortcut to your favorite contact to the floating bar. This feature is paid. Add website links. 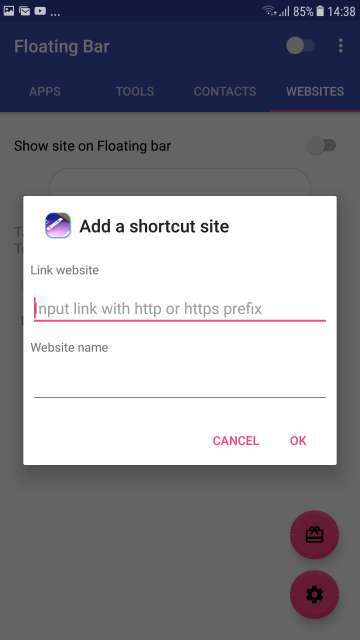 Tap the + button to add shortcuts to links of your favorite websites to the floating bar. This feature is paid. 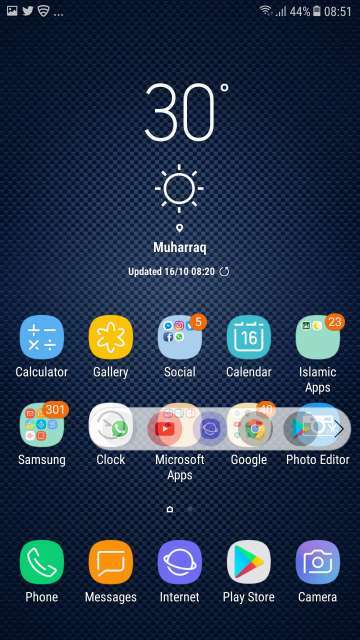 Tap the gear icon located at the bottom right-hand side to access settings. 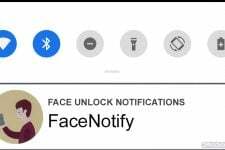 Here you have the option to choose the floating bar style, show the floating bar on the lock screen or not, collapse the bar once you tap anywhere outside the floating bar. Moreover, you also have the option to set the opacity of the floating bar. 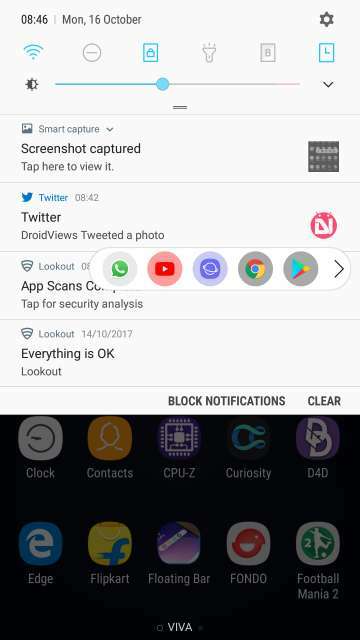 Note: If you do own a Samsung device, to prevent the app from shutting down by itself, go to Settings > Device Maintenance > Battery > Unmonitored apps > Add apps > check Floating Bar and then press DONE. 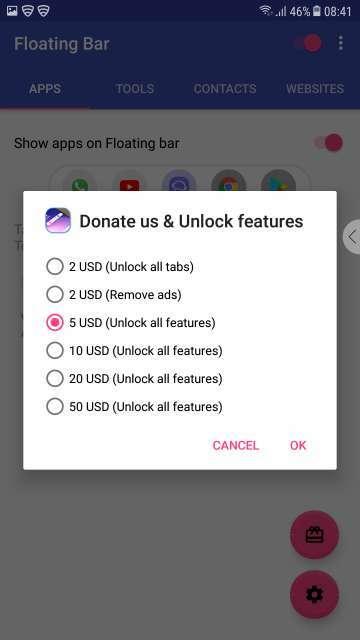 Tap the gift icon located above the settings icon to donate and unlock all the features (tools, contacts, and website link shortcuts feature). However, you can also purchase each tab for $ 0.99. 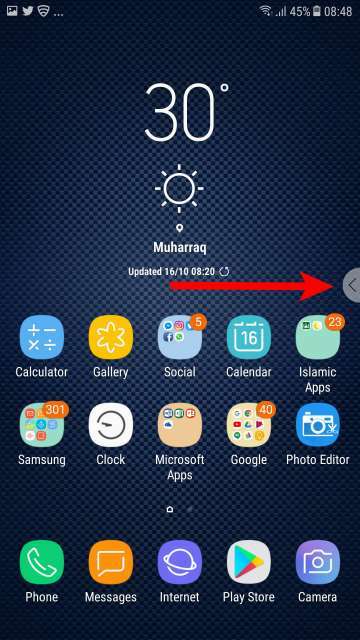 The floating button used to open the floating bar is located at the right-hand edge of the screen. The floating button is indicated by the red arrow in the screenshot. Moreover, you could also change the position of the floating button anywhere at the left or right edges of the screen. The floating bar is open. Moreover, it contains five of my favorite app shortcuts. 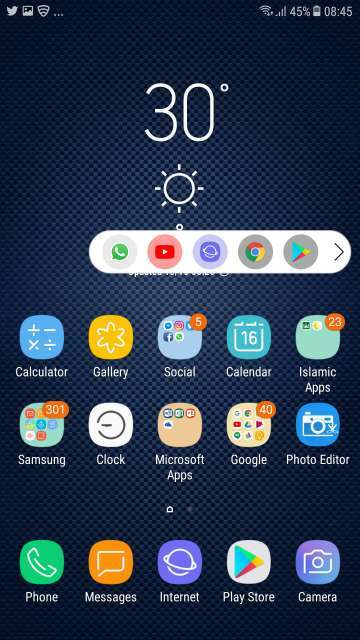 The Floating bar in action on top of Samsung internet Browser. The bar on top of the notification center. The Floating button re-positioned to the left-hand edge of the screen. The floating button is indicated by the red arrow in the screenshot. Relocated the floating bar to the left-hand edge of the screen. From the settings, you could also set the opacity of the floating bar to your liking. Altered the opacity of the floating bar. You can alter the opacity in the app settings. 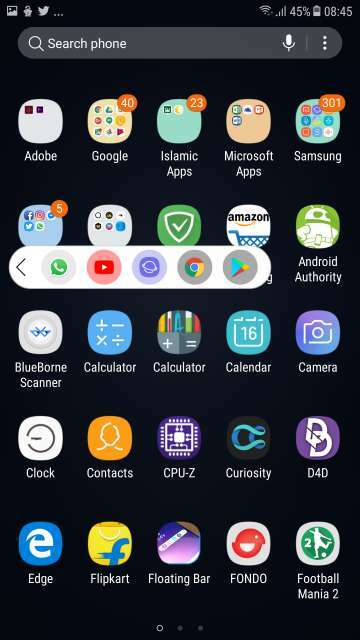 So here you go folks, on my review and an in-depth look and review of an app that mimics the floating bar feature found on the recently launched flagship smartphone LG V30. Feel free to chime in the comments section below on your take and experience with this neat little app. 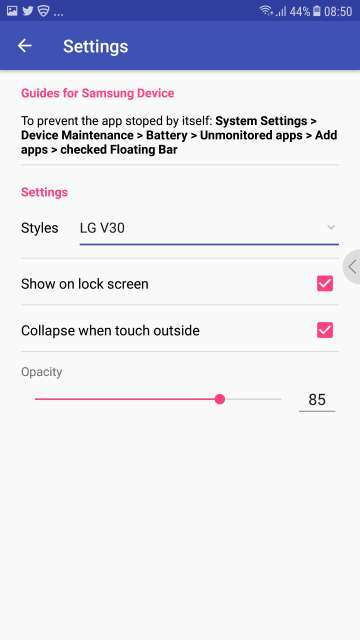 Download Floating Bar LG V30 via the Google Play Store link given below.